At Nagasaki University, we have a five year PhD program, that provides 600,000 yen a year to enrolled students for research. In their second year, they get a midterm evaluation. So they need to present their research progress and near-term goals.Ms Song is working on how environmental estrogens and climate change (temperature increase) affects the reproductive development of the common goby, マハゼ.She has a lot of experience speaking, so the presentation went well. In the evening, the students were involved in another exercise and collected plankton samples. They deployed two underwater halogen lights to attract plankton and fish. After collecting animals for an hour, the students brought them back to the lab for identification. They will sketch and identify at least 5 species. I went to Jeju University, because we extended a number of exchange programs for another five years or so. We got to visit the new president of the university, Prof. H-J Huh, as well as the International Exchange dean, the den of the College of Ocean Sciences, and the vice dean as well. We had a good discussion, regarding our visit and how we can improve our exchange programs. One of the key objectives of these programs is to encourage our students to interact internationally. I think we all agreed to that. The task for them now is to find a good liaison officer, who will be interested in coordinating activity on their side. Hope they can find someone. Anyways, large parts of the campus are being renovated and new building are popping up all over the place. The Nagasaki University Liaison Office was also moved, and is next to their public relations department. Afterwards, we had dinner at a restaurant where they serve Jeju's famous pork. Our Kagoshima fieldwork ended in a hurry, because we heard some thunder out in the distance. It never really rained though, which was good since it took a while to rinse and cleanup all of the equipment. We went back to the hotel, where the students spent a few hours downloading all of the data off the data-loggers. We put a few gopros in the water, so hopefully I can show some videos later. As usually, we took the time to go have some gyoza and soft-serve icecream. Anyways I am now off to Jeju University for a few days to visit the Chancellor and get him to autograph a few documents. We have a MOU to conduct student exchange programs and to provide a double-degree program (you can get a degree from Jeju and Nagasaki) for the MS students. The Kagoshima University rowboat racing team is practicing with a Mt. Sakurajima erupting in the background. We're going to take measurements all day today. We're in Kagoshima for some fieldwork. One of my students is trying to measure mixing in seagrass meadows and sargassum beds using fluorescent dyes. Since most of our earlier experiments were during the winter, we completely forgot about the stratification that can occur in these ecosystems.We will need to adjust our dye injection technique so that dye is as neutrally bouyant as possible. Typhoon is going to pass through southern Nagasaki tonight or so.Inside the port is still somewhat calm. Had the exam here. The examinee had to take an english exam, an essay, and a interview.I think he did ok. Anyways, we are catching the red eye flight back to Fukuoka after filling up on pho. In Can Tho to help administer an exam for our 5year PhD program with Prof. Sakakura. Was expecting two examinees, but one got poached by a different university.Oh well. It would have been a free ride with a stipend. Too bad.Had pigeon and gobi (a local fish) for dinner. Not bad. The title says it all. No fieldwork in Iriomote this year. Unlike last year, there's no typhoon this year. But the weather is not good. 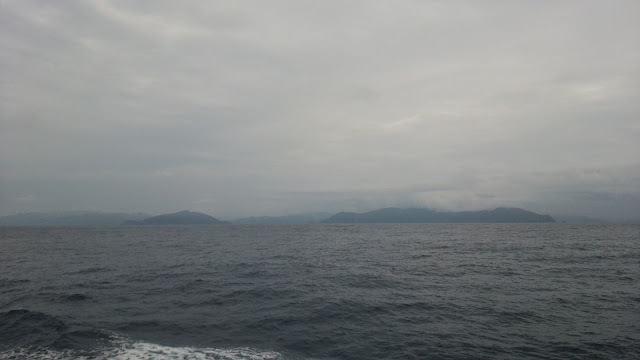 Clouds and rain is the forecast for Iriomote. We finally arrived near Amami Oshima, and so I attached a bad photo.The going from Nagasaki was a bit rough, but its been smooth the last few hours. It's called Gonionemus vertens or カギノテクラゲ. This little guy decided that my wrist was a great place to take a break. It was just itchy at first, but that was 6 hours ago. Now I have muscle and joint pain, throughout my body. Lot's of fun. Today is the second day of our field lab for the third year students. Usually, it's held on Tuesday, but we were rained out. So, we had to use our backup day. There is one more field lab, then it's two days In the PC lab, to do some stats with R.We get them to throw around a quadrat about 40 times or so, to get counts of sea urchins and starfish and coverage estimates of seagrass and sargassum.The students seem to enjoy the field portion od the lab... Not too sure about R though. There is a lab at ECSER that interested in how floating rafts of seaweeds attract juvenile fish. Today, we went to help them collect some Sargassum horneri for their experiments. 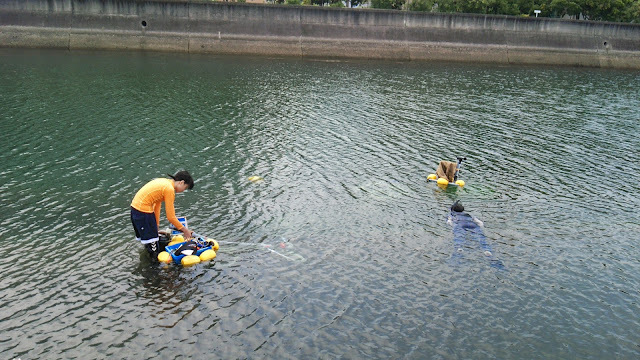 They plan to create a raft, with a load of cameras and other sensors, to see what species of fish are attracted to it. We went to an area called Benten-Shirahama, which has a rich flora of seaweeds. In fact, there are at least 5 species of Sargassum, growing in large beds. This is rather unusual, since a lot of the coastal areas in Nagasaki has lost much of this flora. My lab was responsible for collecting the Sargassum horneri, and their lab was given the task of transporting it back to shore. You can barely see them in the photo, but they are in two kayaks full of Sargassum. Another view from the wharf. Ms. Koga has setup her flow-chamber experiment, and doing a practice run. She's placed about 2 kg wet-weight or so of Sargassum horneri into one chamber, with a pair of ProODOs (YSI, Inc.) to monitor the dissolved oxygen and temperature. A better look at one of the ProODOs. All setup and ready for a trial run. My first graduate student, completed his masters and left the lab in March. He works for a big construction / environmental assessment company now, and is in Tokyo. Anyways, we went out for one of the last surveys of the season in Omura Bay. I don't really remember but I think the water was about 8 degrees C. It not that bad, as long as the sun is shining and the wind is not blowing. The screen grab says it all.